a book review by Barbara Bottner: Who Will I Be? At what age do children first connect the dots to realize that people have jobs? They do something called “work.” But how can the world find the right people to grind lenses for glasses, prepare food, build ships? At what point do little ones begin to wonder, even if vaguely, where they might fit in. Many times the careers kids first learn about are the obvious ones: president, movie star, fireman, space explorer, nurse. 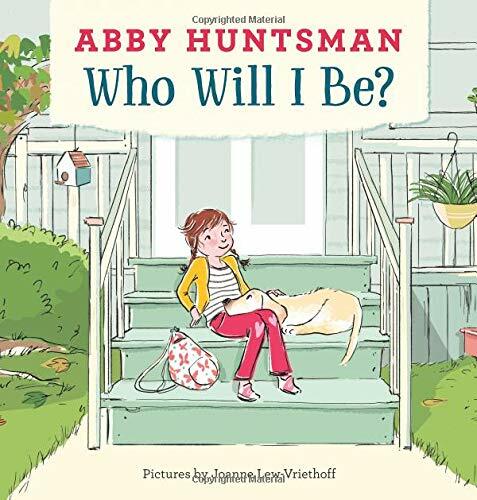 Abby Huntsman, currently a co-host of The View, and a previous host of Fox and Friends as well as other TV shows and Sirius XM radio, takes us into Isabel’s life when her teacher poses the question, “What do you want to be when you grow up?” Other children have answers but Isabel only has questions. The book moves through the day with Isabel and her dad as she begins to see how the world works, and how, in many cases, the jobs humans have involve helping each other. We meet a veterinarian, a teacher, a police officer, a librarian, a garbage collector, a gardener, a pastor, and lastly, her mom, the mayor. This is a well-intentioned, practical book for teachers and parents to invite a conversation about usefulness, values, and humanity as it relates to work. The accessible, humorous illustrations are by Joanne Lew-Vriethoff, who has illustrated for Eileen Spineli, Malcom Mitchell, and Stacy McAnulty. Lew-Vriethoff has also received numerous awards from the IRA and Bank Street. Both the straightforward, no nonsense narrative and art suits the material very well. There is a missed opportunity, however, to explore other reasons people find meaningful work. This is the realm of creativity. It’s important to have roads and teachers and doctors, but there’s also the argument for transcendence. The expression, communication, revelation, and inspiration that art offers connects all people across all barriers; it has lifted spirits, filled hearts, and even stopped wars. This realm is completely missing here. Artists not only open us up to new possibilities, they even illuminate and expand the more mundane, practical occupations. Maybe Huntsman’s next book could explore the universal value not just for service, which is a wonderful message, but for doing something equally important: inspiring. Barbara Bottner is an award-winning author of more than 40 books in all areas of children's and young adult literature.